He personally thanked Gassama, gave him a medal for courage and said he would also be offered a role in the fire service. 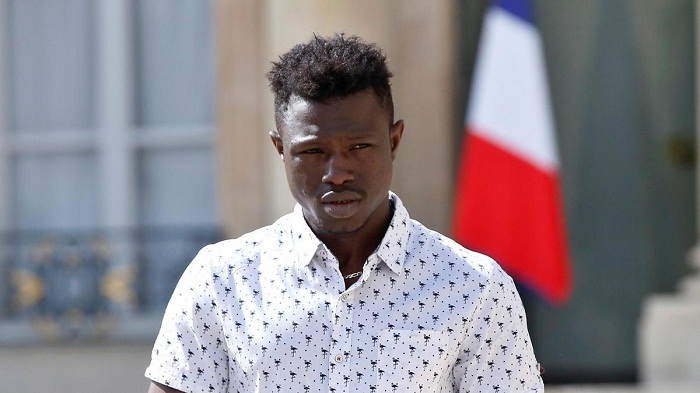 Gassama is said to have arrived in France last year, taking the long and dangerous journey to Europe via a boat over the Mediterranean to Italy. He told Macron: "I just didn't have time to think, I ran across the road to go and save him. Gassama's four-storey dash is a reminder of another Malian hero who gained national prominence in January 2015 during an extremist attack on a Jewish supermarket in Paris. Two weeks later - after six years of struggling to secure legal residency in France - Bathily was given a medal and a French passport by then President François Hollande. Like Bathily's selfless leadership to save the hostages, Gassama's heroic climb to save the boy cements the image of Mali as a country with a culture of old-fashioned public spiritedness.